The Pilot is an SUV that really stands out of the pack. Now in its third generation, the Pilot is considered one of the best vehicles in its segment thanks to a number of fresh innovations and features. For 2017 Honda has added Apple CarPlay and Android Auto compatibility to the 8-inch touchscreen as well as many new features and elements throughout the vehicle. Available in LX, EX, EX-L Navi, EX-L RES and Touring trims, there is a 2017 Honda Pilot for every budget. Under the hood, the reliable and efficient 3.5-liter SOHC i-VTEC V6 makes 280 horsepower and 262 lb-ft of torque in every trim. That means it has plenty of power to drive around in the city or to pull 1588 Kg, or 2268 Kg with the optional towing package. The 6-speed automatic comes with Grade Logic Control. It is smooth and seamless, but the 9-speed auto in the Touring trim is another step above it. In terms of speed and responsiveness, it’s better than what any rivals have to offer. 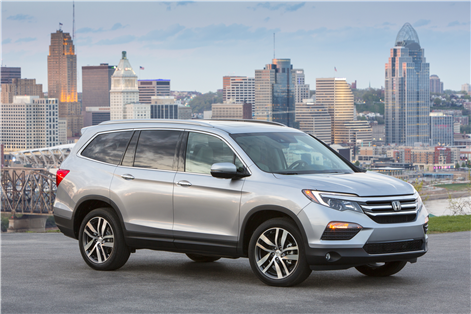 Naturally, the 2017 Pilot gets Honda’s Intelligent Variable Torque Management AWD system, as well as the Intelligent Traction Management System. In light off-roading conditions, the Pilot is astonishingly capable. 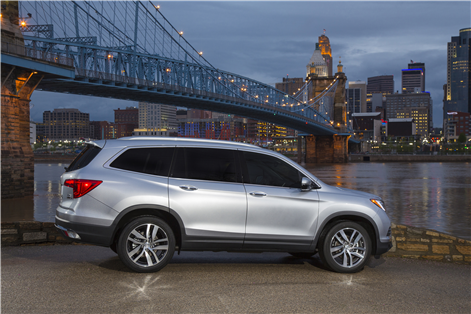 The 2017 Honda Pilot offers a striking presence. Even if it includes a few design cues from its smaller siblings, the CR-V and HR-V, it is still original and unique in its own way. Standard exterior features include LED tail lamps, body colored handles and body colored sideview mirrors. Those mirrors are also heated on all trims. Every trim above the LX trim gets standard mirror-integrated LED turn signal indicators as well as a one-touch power moonroof. For optimal style and exterior features, opt for the Touring version and get a panoramic moonroof as well as auto-levelling headlights. Inside you get most of the luxuries and amenities you’d only find in SUVs that cost twice as much. 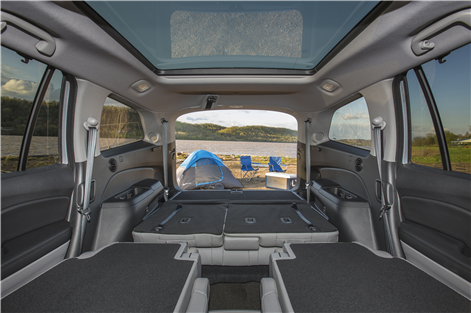 Standard equipment includes three 12-volt power outlets, one 115-volt outlet (in EX-L RES and Touring), Active Noise Cancellation, Ambient lighting, the HomeLink remote system (on certain trims), and much more. Headroom and legroom are class-leading, as is the impressive amount of cargo room ranging from 3072-3092 Litres behind the front row. Adults can sit comfortably in the third row. 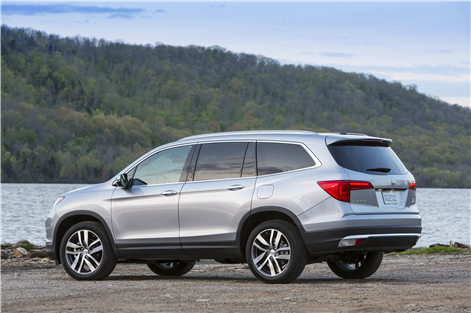 The seven-seater SUV segment is full of good vehicles, but the 2017 Honda Pilot offers better value than its rivals. Come and see it at Orleans Honda today.